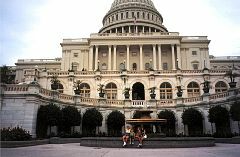 We returned to Washington on Thursday August 23 to visit the U.S. Capitol. We had an appointment to have someone from congressman Bill Luther's office to take us on a tour. 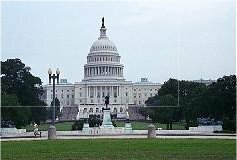 We parked on one of the cross streets that run parallel to the U.S. Capitol. 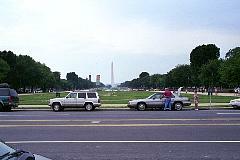 Here is a view of the Mall with the Washington Monument in the distance. The U.S. Capitol is an inspiring building. A little behind schedule, we made our way to the Cannon House Office Building which is to the right of the capitol in the picture to the left. The congressman was back home in Minnesota, but a young aide took us through and underground tunnel into the Capitol. This was only his second week on the job. He did a good job. He did accidently have our elevator stop near former Majority Leader Senator Trent Lott's Capitol office, and a guard rose to challenge us. With an apology we were quickly on our way. Here is the view up at the Capitol Rotunda. 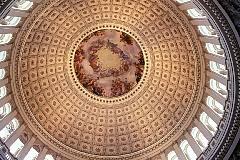 The guide said that if you are with your congressman, you can actually be taken up and look down from the Rotunda. Look under the larger windows, and you can see the walkway. The thing I take away from our tour was how small and kind of dumpy the Senate chambers are, and that the House of Representatives has no desks, just upholstered benches. I lived in Sanford Hall at the U of Minnesota, we saw her statue in the Capitol, one of two allotted to each state. As we exited the building after our tour this is a look back.